Rory McIlroy admits he has to take a "selfish view" of his special exemption to remain in the Race to Dubai, despite the repercussions for other players. The ankle injury which forced him to sit out three tournaments this summer means he will not play the 13 events needed to remain in the Race to Dubai. 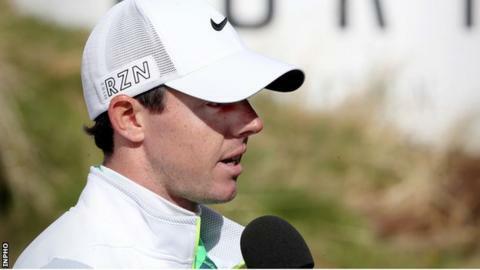 However the European Tour cited 'exceptional circumstances' in granting McIlroy permission to play. "I'm at least able to have a goal for the rest of the year," he said. The world number three was unable to defend his Open championship at St Andrews in July after sustaining an ankle injury while playing football with friends in Northern Ireland. Despite only being able to play in 12 European Tour events, including the upcoming Turkish Open which he recently added to his schedule, he currently leads the Race to Dubai rankings and is trying to win the Harry Vardon Trophy for the third time in four years. "I feel like I have a chance to win the Race to Dubai and it would look pretty silly in Dubai if I was leading and couldn't play," he explained. "We had to be careful, especially because I'm included in the Race to Dubai now, so number 61 doesn't get in, number 111 doesn't get his card... so it was a tough decision for them (European Tour) to make. "For me it's more about the 111th guy, who loses his card. That's the big thing. "If I was to look at it really selfishly, the 111th guy could have made one more putt or cut to get his card. I just have to think about myself and take a bit of a selfish view of it, I'm afraid. "I would have played more if I could."